Do you have foot, leg or knee pain? Are you about to start a new exercise program? 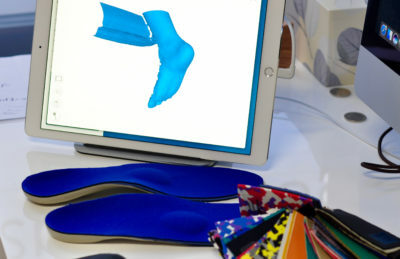 Foot orthoses (also referred to as 'orthotics and 'arch supports) are used to support the foot in a manner which alters pressure under the foot to influence movements of joints and muscle activity. There are many shapes and sizes and levels of customisation available. The podiatrists at Northern Foot Clinic have undertaken world-class research exploring the effects of foot orthoses on foot pain and rehabilitation; as well as how foot orthoses influence biomechanics (movement and function). There is very good research evidence supporting the use of foot orthoses in the treatment and prevention of several common conditions affecting the foot and leg. Foot orthoses can be used to treat people with all types of foot postures/shapes. What will the Podiatrists at Northern Foot Clinic do for me? If foot orthoses are needed, what happens next? ​​Where can I find more information about flat-feet? We recommend the following website (high-quality and independent information for consumers) for more detail about flat feet. Scott LA, Munteanu SE, Menz HB. Effectiveness of Orthotic Devices in the Treatment of Achilles Tendinopathy: A Systematic Review. Sports Medicine. Sports Medicine 2015; 45(1): 95-110.2014. Munteanu SE, Scott LA, Bonanno DB, Landorf KB, Menz HB, Cook JL, Pizzari T, Scott LA. Effectiveness of customised foot orthoses for Achilles tendinopathy: a randomised controlled trial. British Journal of Sports Medicine: accepted for publication (August 2014). Barton CJ, Munteanu SE, Menz HB, Crossley KM. The efficacy of foot orthoses in the treatment of individuals with patellofemoral pain syndrome: a systematic review, Sports Medicine, 2010; 40(5): 377-395. Franettovich MM, Murley GS, David BS, Bird AR. A comparison of augmented low-Dye taping and ankle bracing on lower limb muscle activity during walking in adults with flat-arched foot posture. Journal of Science and Medicine in Sport. 2011; 15(1), 8-12. Munteanu SE, Bassed AD. Effect of foot posture and inverted foot orthoses on hallux dorsiflexion. Journal of the American Podiatric Medical Association 2006; 96(1): 32-7.